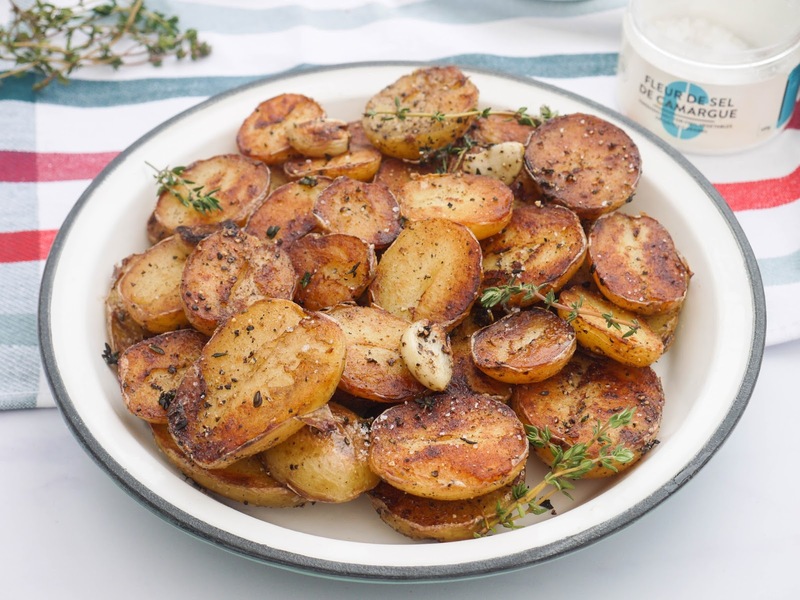 This Muslim Girl Bakes: Crispy Garlic Thyme Potatoes. And, what a beautiful day we have here. Blue skies and blazing sunshine mean it's going to be a lovely day here indeed. Today, I am finishing shooting this pie and refreshing this recipe. I'm also testing out a new drinks recipe because this Ramadan on the blog, will be all about the drinks. 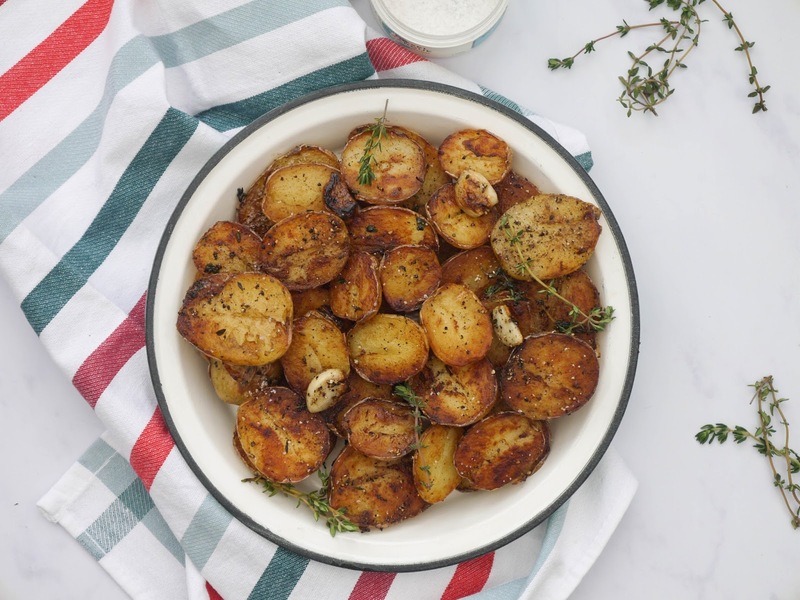 But first, let me share these crispy garlic thyme potatoes with you. I first made them last year when we grew our own potatoes. 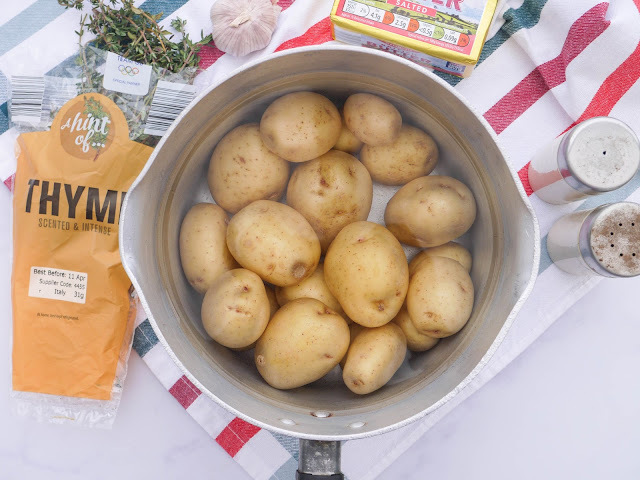 I'm no expert at growing vegetables but the potatoes compared to other things were really simple to grow. 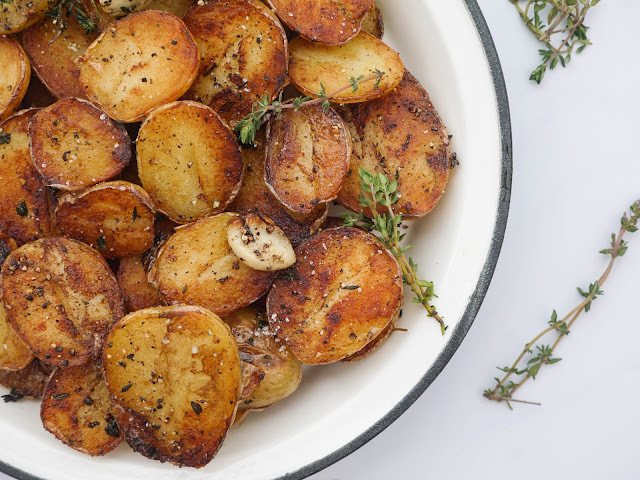 There wasn't much care needed, they did their own thing and a few weeks later, we were picking out our own red potatoes from a giant pot of soil. Even better was the fact that they tasted amazing. Who knew a potato could taste so good? 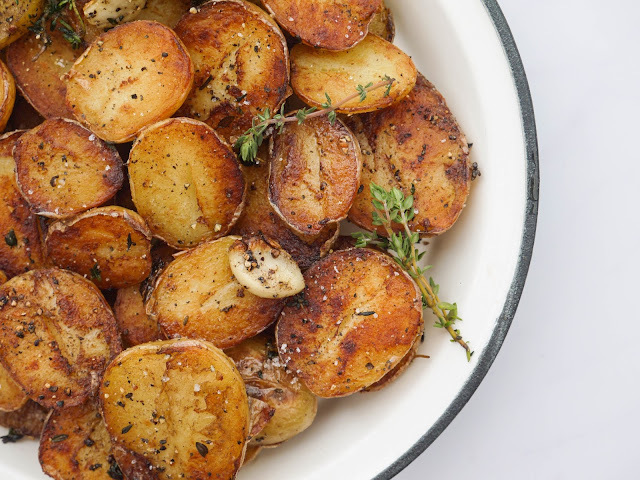 This recipe was exactly how we cooked them. You can use homegrown potatoes if you've been so lucky this year or you can use those new potatoes that are in season at the moment. The little ones are my favourite. 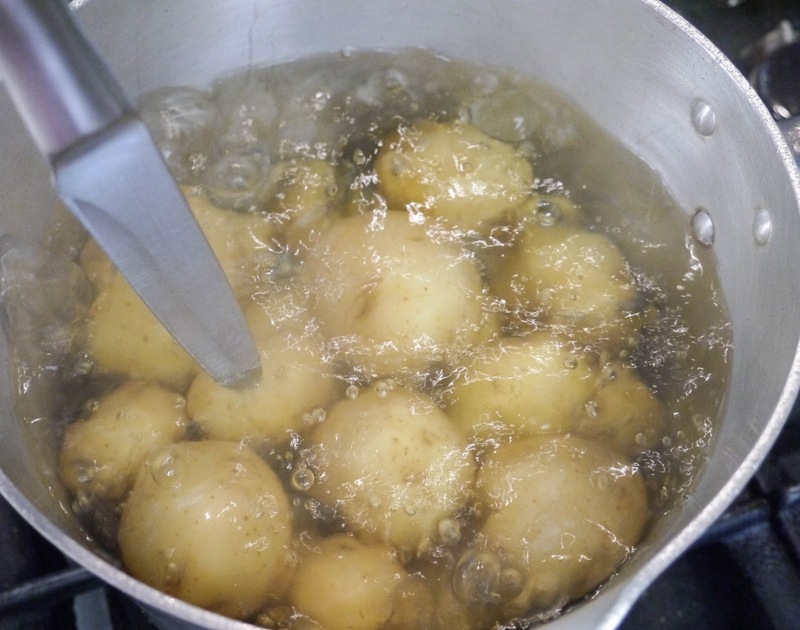 The potatoes are boiled until just cooked then drained and allowed to dry a little. 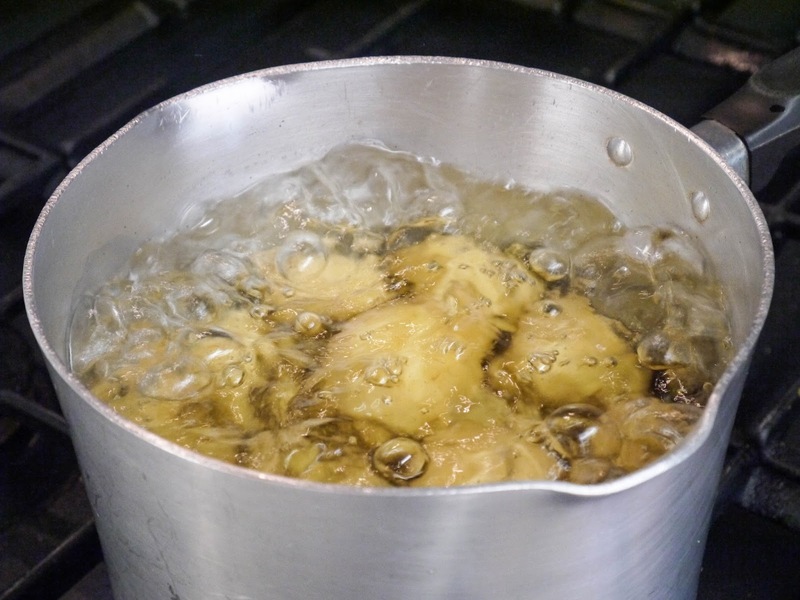 We don't want to be frying wet potatoes. 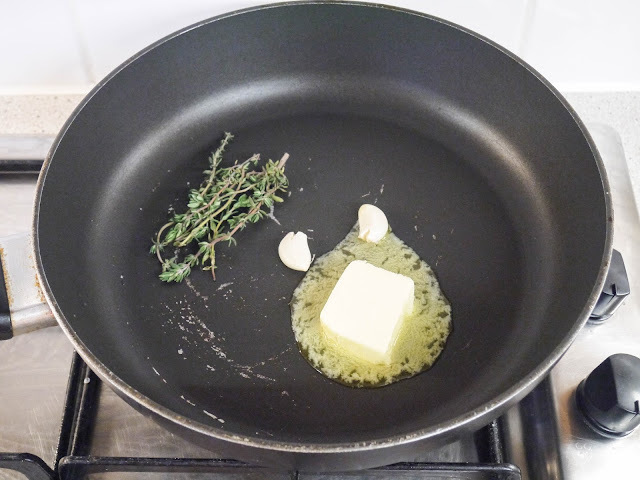 Then, we melt salted butter with garlic and fresh thyme allowing the two to infuse all their flavour into the butter. 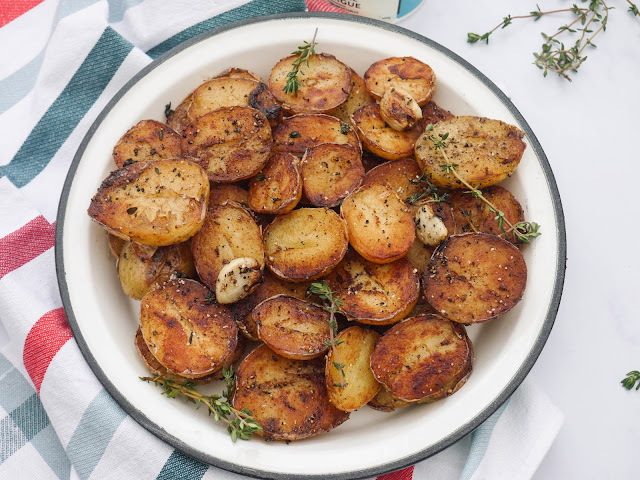 The potatoes are sliced in half and fried on both sides until crispy and golden brown. The flavour here is the best. 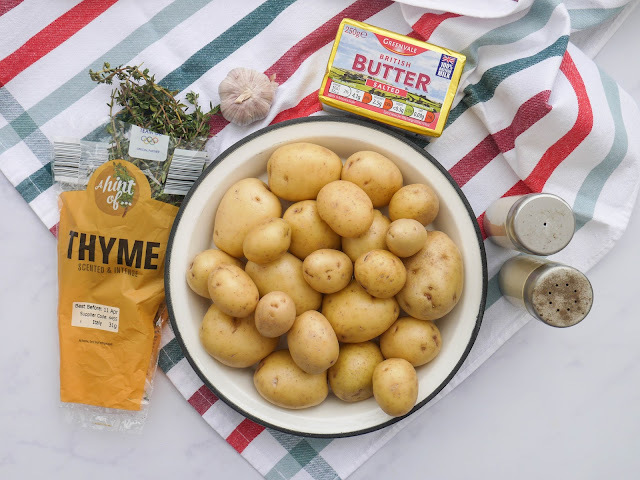 A real example of how the simplest ingredients brought together give the best results. 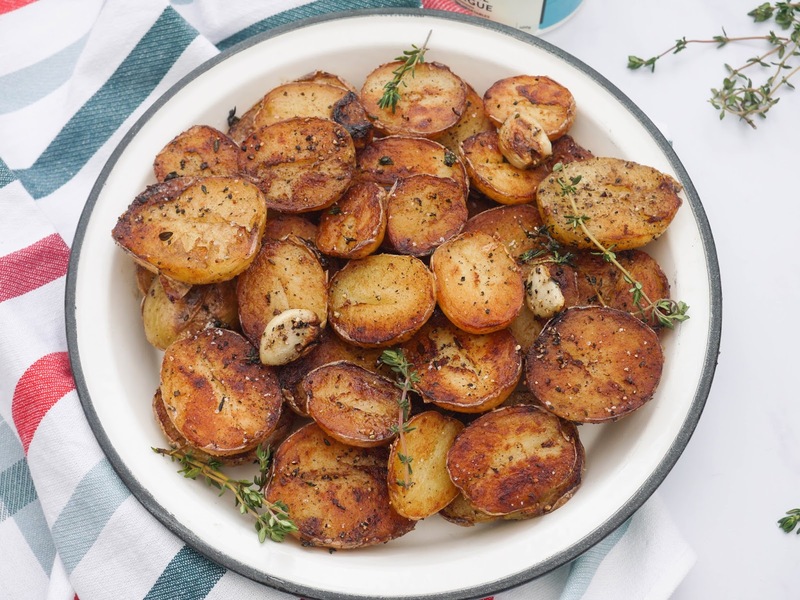 Take 1 packet Baby Potatoes - 1 kg or about 20 small potatoes. 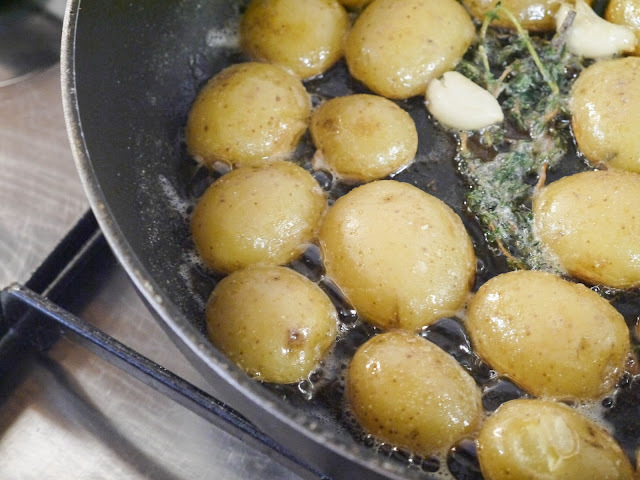 Place them into a large pan and cover with cold water. 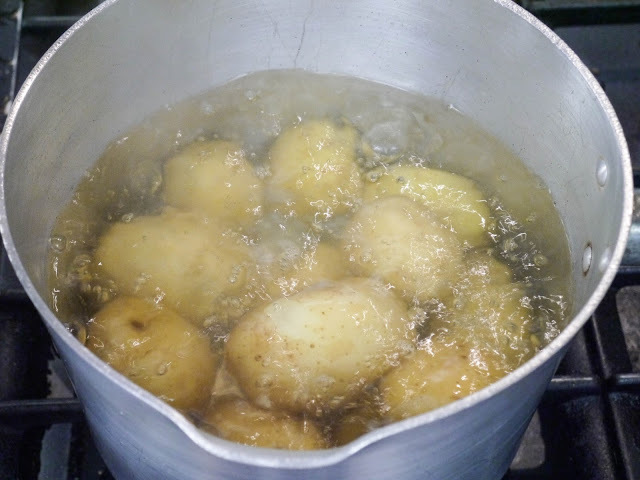 Then, turn down to a simmer until the potatoes are just cooked. Keep checking with a knife. The smaller ones may be cooked before the bigger ones so take them out earlier. ... drain out all the water. Set aside for around 30 minutes so that the potatoes can dry a little. 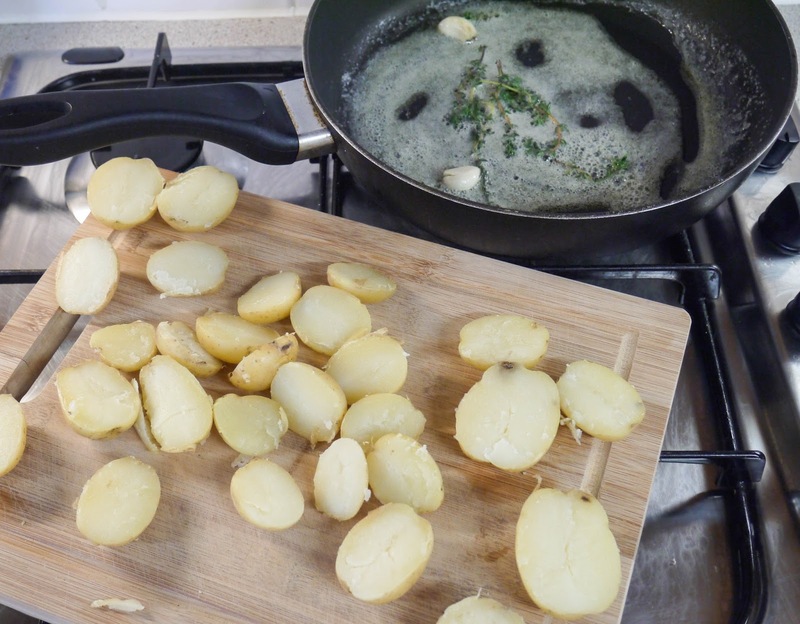 Once the potatoes have dried, slice them in half. 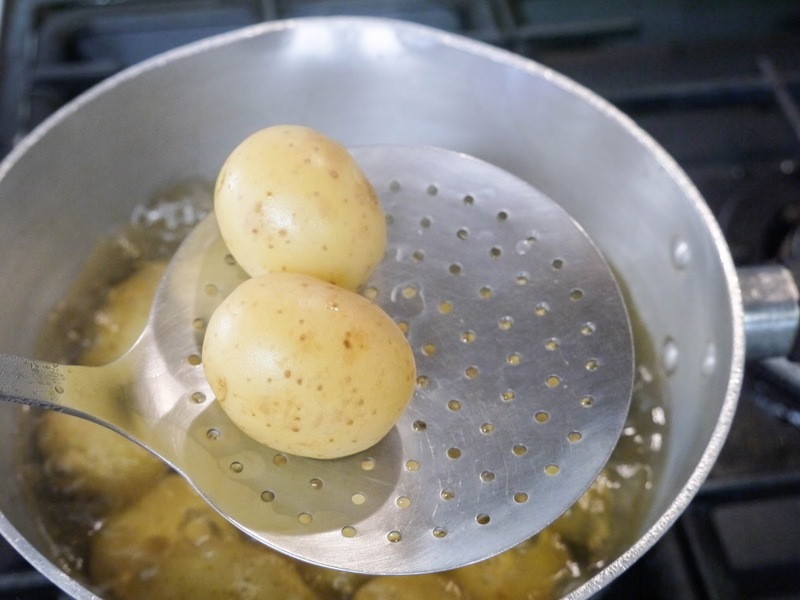 To fry the potatoes, take a large pan. 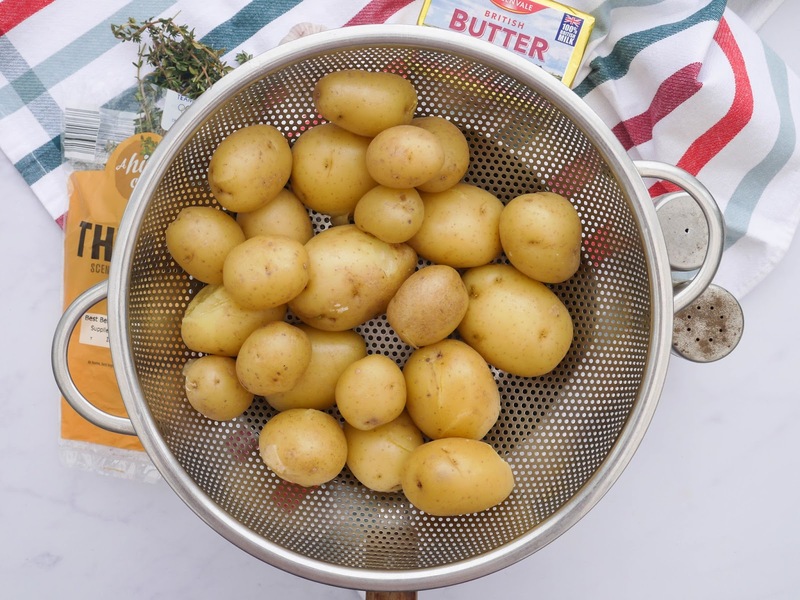 And, grab the butter. 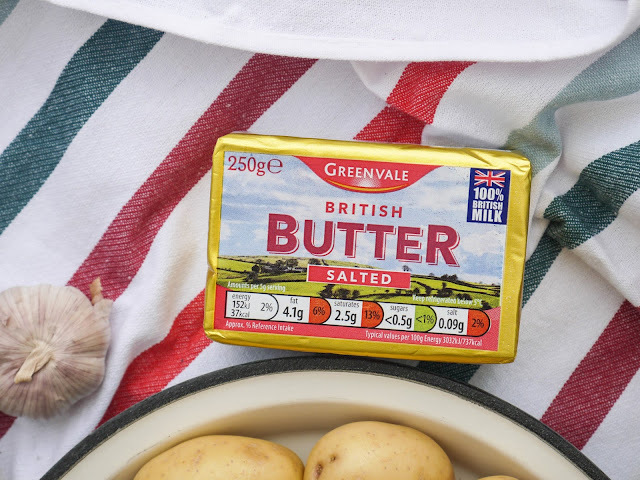 I am loving salted butter at the moment so that's what I recommend. I fried my potatoes in two batches. So into a pan over a medium heat, place a knob of Salted Butter. Add in a little Vegetable Oil as well to stop the butter from burning. Then, take the garlic and fresh thyme. 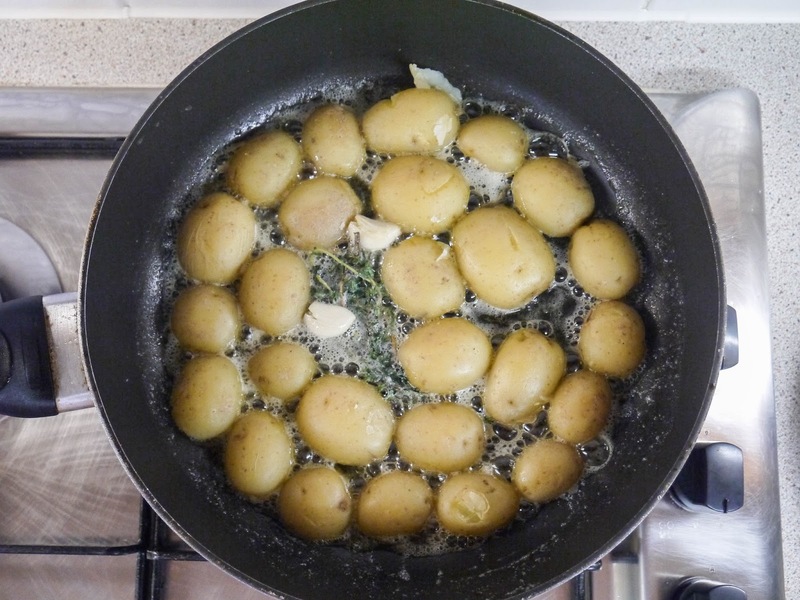 Add a few sprigs of Fresh Thyme and 2 Garlic peeled Cloves, in with the butter. Let everything fry together for a minute. Then, take the sliced potatoes. And, place them skin side up into the hot butter. Let them fry over a medium heat. 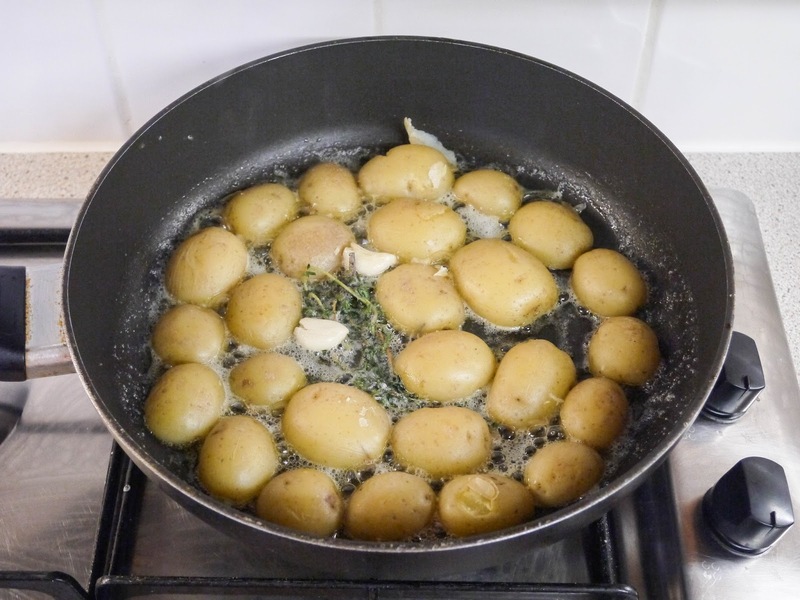 Keep your eye on them and add more butter or vegetable oil if the pan is looking a little dry. 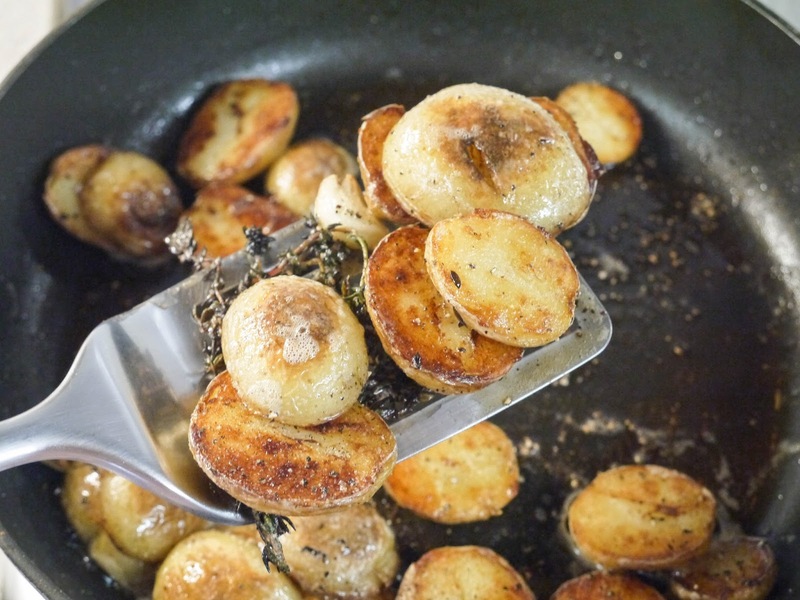 ... season the tops really well with Salt and Black Pepper. 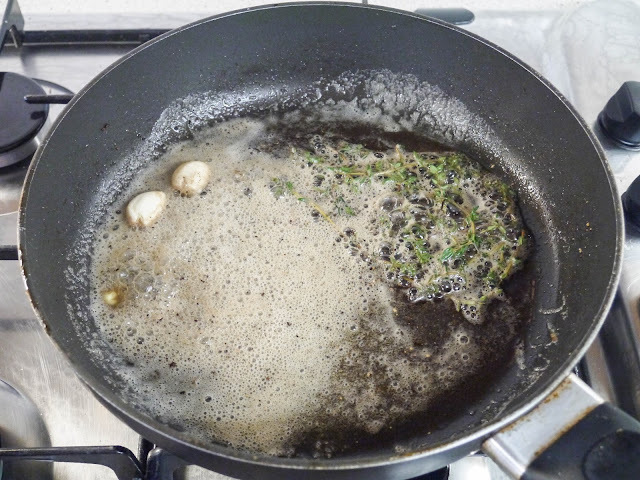 Fry until the skin side is golden brown too, seasoning again with plenty of Salt and Black Pepper. 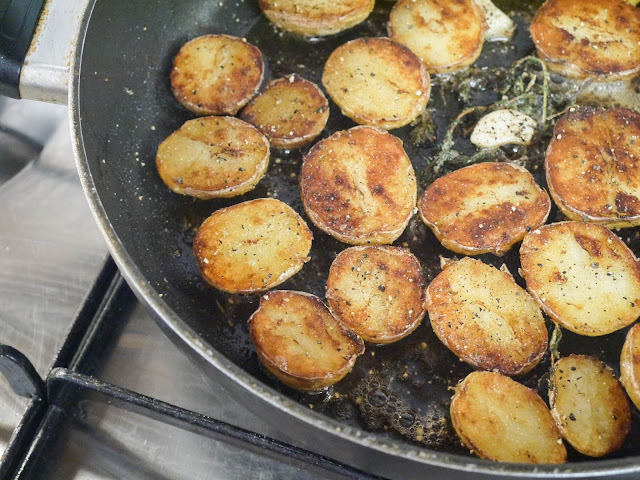 Once you're happy that the potatoes are really crispy, remove them from the pan. I fried my second batch of potatoes and then, they're ready to eat! 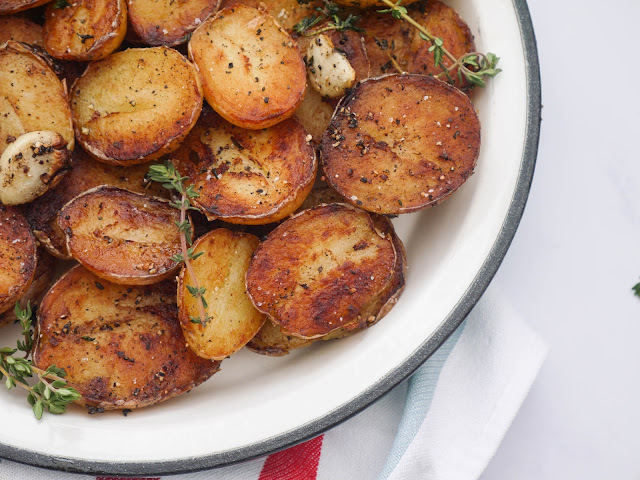 These buttery potatoes are the perfect side dish! 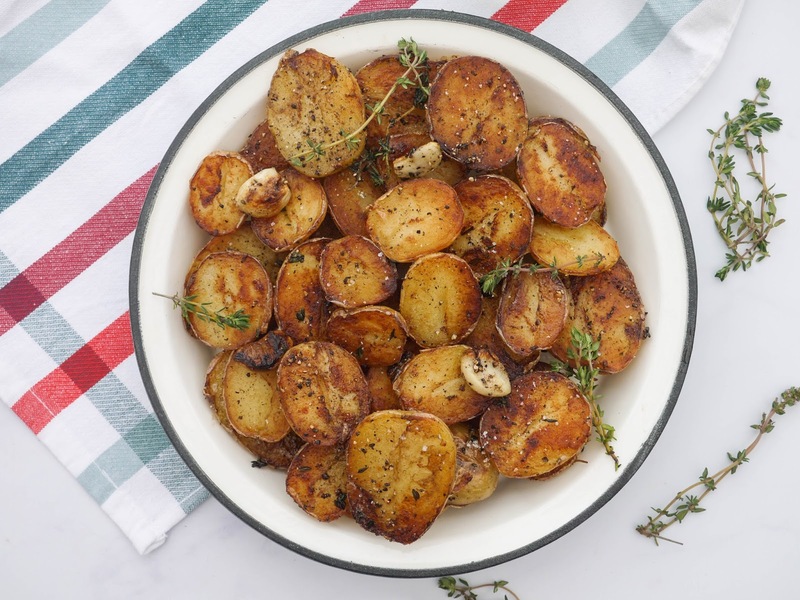 They would go perfectly well with this spicy lemon roast chicken and gravy. The best combination for your next Sunday lunch! Prep Time: About 10 minutes + 30 minutes to dry the potatoes. 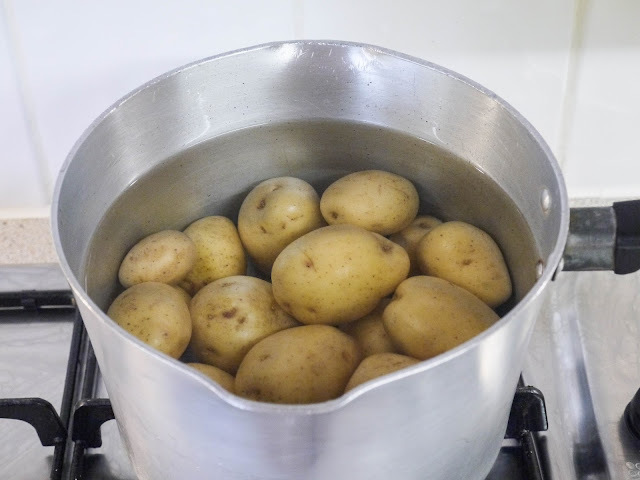 Place the potatoes into a pan of cold water. There should be enough water to cover the potatoes. Bring the potatoes to a boil over a high heat. Then, turn down to a simmer until just cooked. The smaller ones may be done sooner so take them out earlier. My small ones took 10 minutes whereas the big ones took 15 minutes. 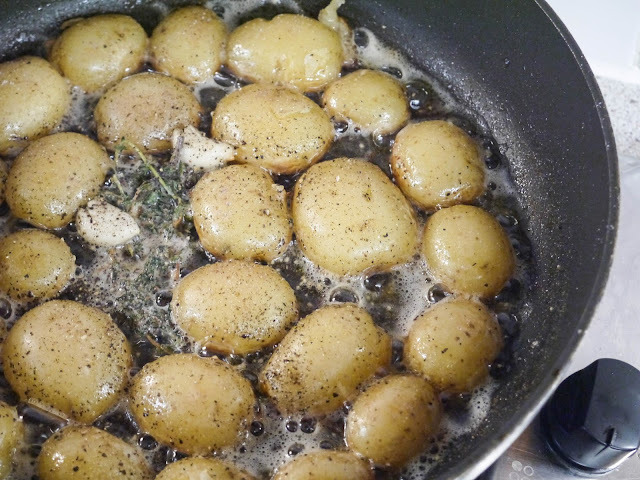 Drain the potatoes and let them sit until dry - about 30 minutes. 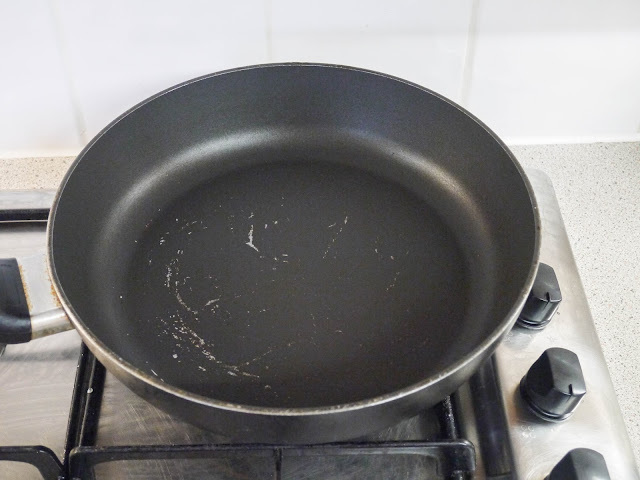 We don't want them wet when they fry. 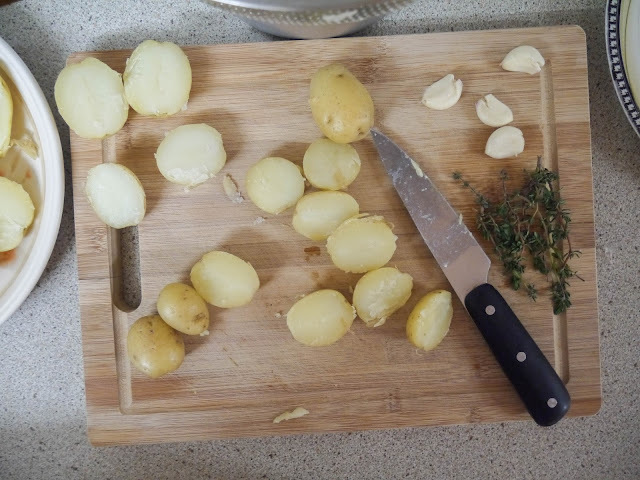 Slice the potatoes in half. 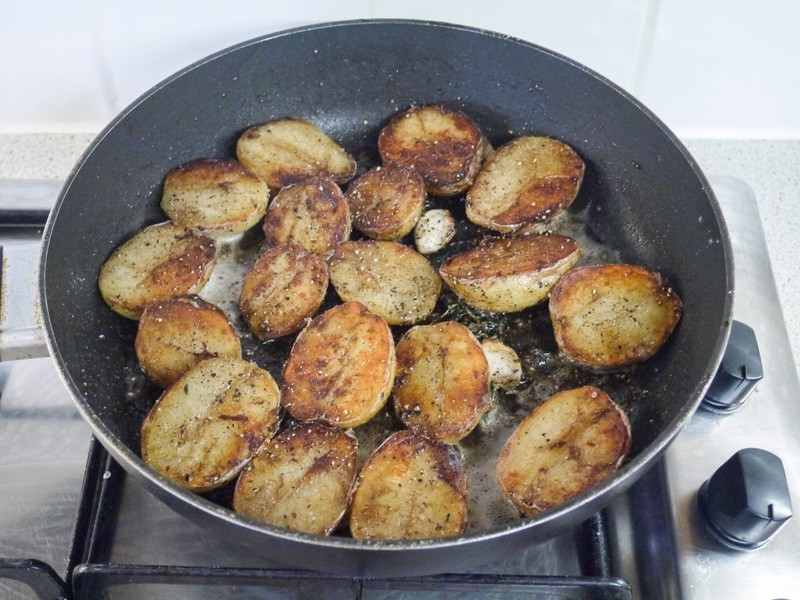 I fried my potatoes in two batches. 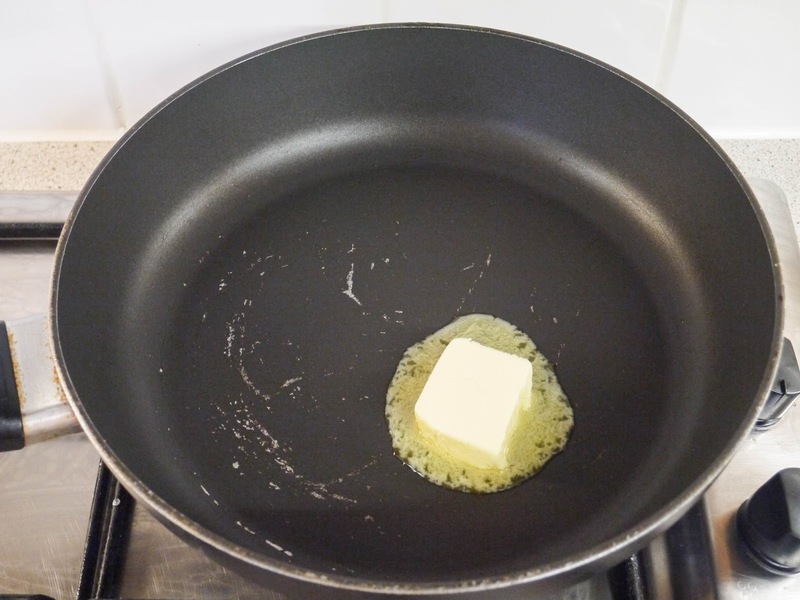 Melt a knob of butter in a large pan. 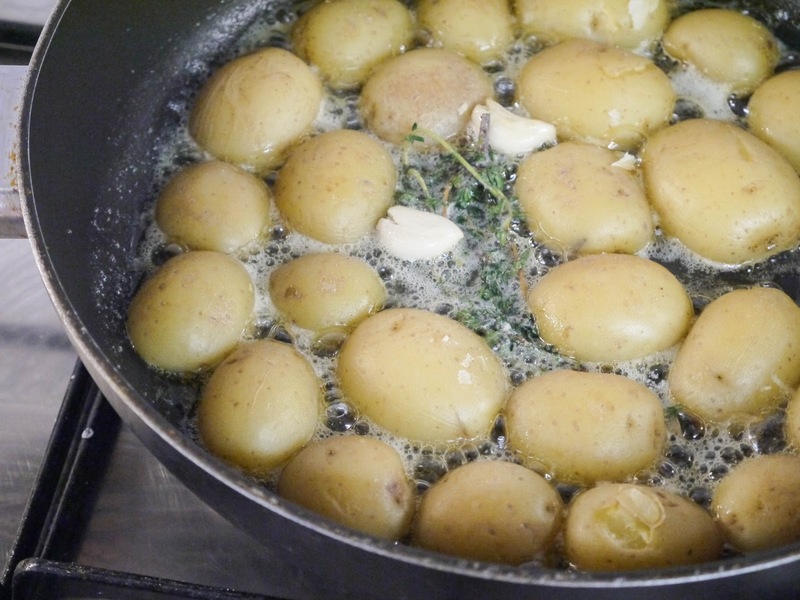 Add in 2 of the garlic cloves and fresh thyme. Let the butter melt a little over a medium heat. Add in the potatoes, skin side up. 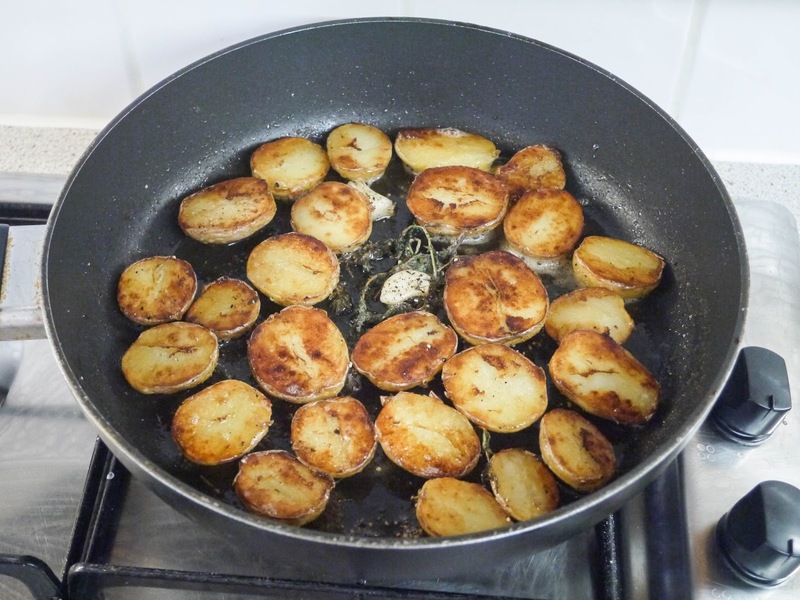 Fry until the bottom of each potato is golden brown, adding more butter or vegetable oil as needed. 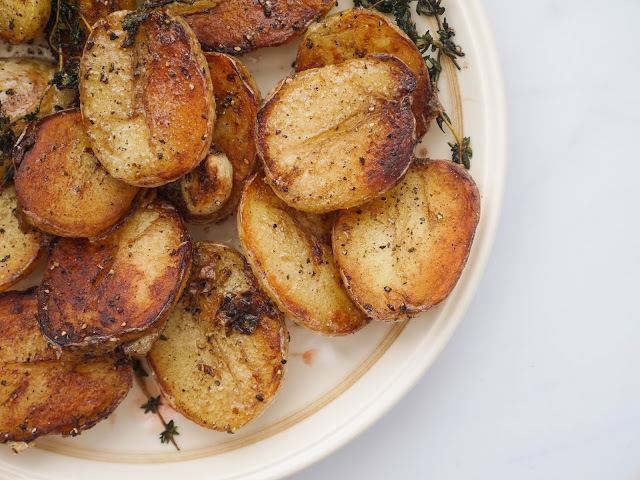 Flip the potatoes and fry until golden on the other side. Season really well with salt and pepper. 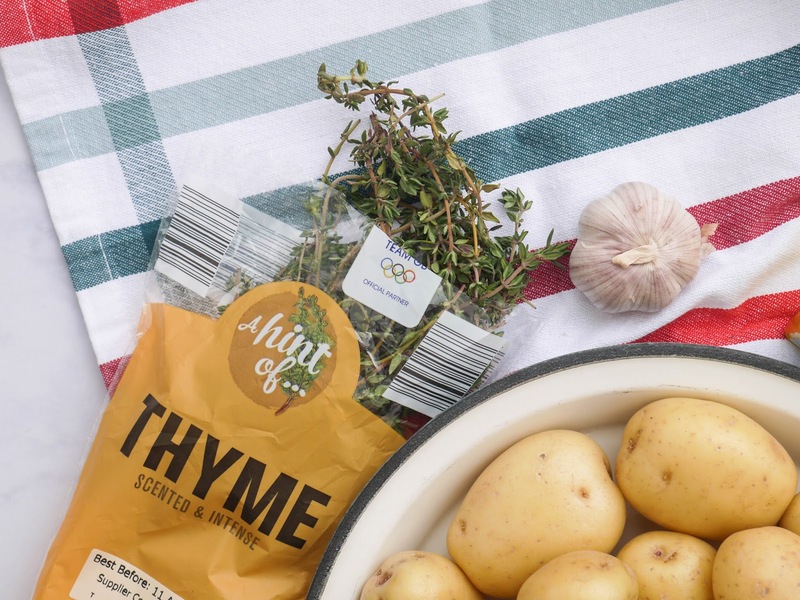 Serve immediately with anything you like! chocolate fudge + pink blossom + 5 o'clock fruit. 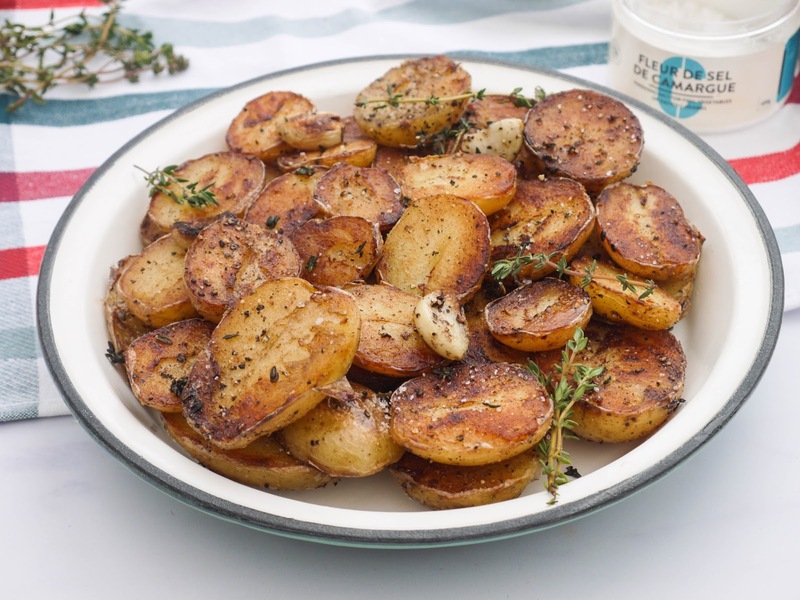 Keep me in your duas please, and enjoy your crispy potatoes!